It is a pity that you can't see the fine texture of the background on the large picture, that's why I also took the below one. 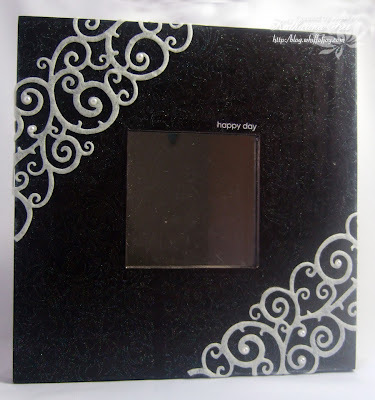 I used the Stampin' Up background stamp "Stitched" and stamped with Versamark ink directly on the wooden mirrow. 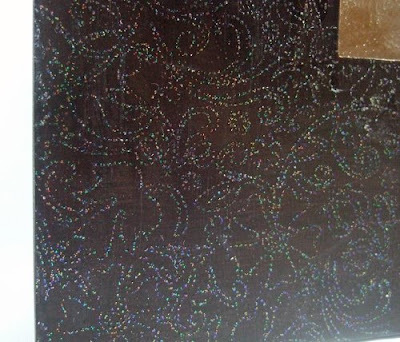 I added "iridiscent ice" embossing powder from Stampin' Up and heat embossed it to get the fine, shimmery background all over the mirrow. The white felt fusion is self adhesive, I simply added some halfpearls. The sentiment is from a SU rubOn. Leider kann man auf dem großen Foto die zart schimmernde Textur des Hintergrunds nicht gut sehen, weswegen ich auch noch die Detailaufnahme gemacht habe. Mit dem Stampin' Up Hintergrundstempel "Stitched" und Versamark Tinte habe ich den gesammten Spiegel bestempelt und dann "iridiscent ice" embossing Pulver darübergestreut und embosst. Die weissen Filzschnörkel sind selbstklebend, ich habe nur ein paar Halbperlen dazugeklebt. Der text ist von einem Stampin' Up RubOn. Thats beautiful-handcrafted presents are so precious!I never thought of using heat embossing when altering-looks great! Boah, der sieht echt stark aus. Schlicht aber edel! Oh so pretty!! I can just imagine what it looks like IRL! Das ist ja eine tolle Idee. Und der Spiegel sieht absoult edel aus. Wow! This is very beautiful! I bet your friend will love it! Great idea that I have to remember for future gifts! AMAZING! What a elegant and such a beautiful gift!!! !